Robert Oster Orange Zest is a bright red-orange. I have a hard time keeping all of the Robert Oster inks straight, because there are so many amazing colors. I purchased my sample of Orange Zest from Vanness Pens. 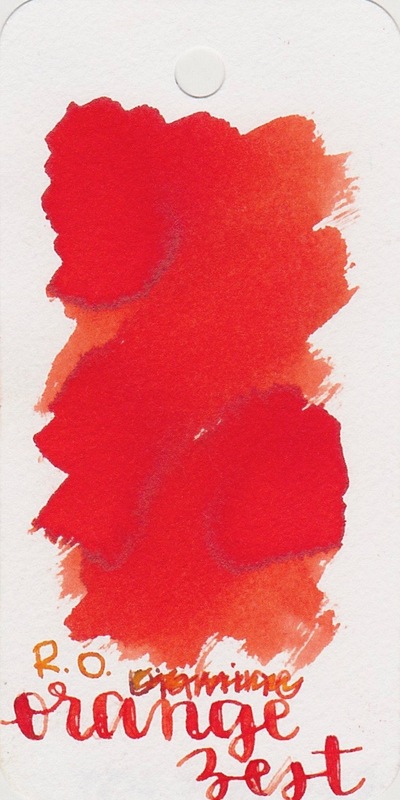 Orange Zest is a bright red-orange with some shading and a little bit of sheen. The ink drops show off the little bit of reddish sheen the ink has. Let's look at how the ink behaves on good paper first. On Moleskine paper, which is not fountain pen friendly, the ink feathers just a little bit, but does have some bleeding, especially in the flex nib. Ink swabs for comparison, left to right (top to bottom for RSS): Robert Oster Orange. Diamine Orange Zest, and Robert Oster Terracotta. Click here to see the Robert Oster inks together. Orange Zest has a lot more red in it than Orange. Diamine Blaze Orange, Diamine Sunset, and Montblanc Lucky Orange. Click here to see the orange inks together. I think Diamine Sunset is the closest in color to Orange Zest. Overall, the ink is well behaved and is easily cleaned out. I think I prefer Robert Oster Orange over Orange Zest, since there is so much red in Orange Zest.